Lynnhaven Inlet Marina is a vision created by Tom Langley to expand marina capacity in Virginia Beach. Commercially-zoned land on navigable waters is completely and fully utilized, and existing bridges and water depths prompt sailboats and yachts to bypass Virginia Beach for other ports. 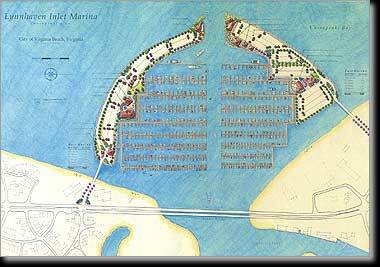 This alternative contemplates a new marina complex north of the Lesner Bridge. To shelter the marina basin, two islands are created by dredging sand from the basin into containment berms. These two islands provide areas for parking, restaurants, yacht clubs, and other upland uses. Each island is connected to the mainland by a bridge thereby allowing adequate flushing for water quality and sand movement. The resulting marina will accommodate >1,300 boats when fully constructed.